I was taught to hold it as soon as my small hands were able to grasp it. Miniature covenants filled nursery rooms where I was sent to make friends. We were all supposed to learn to The Book together. It was going to save us. I hid its words deep within my soul and memory, told that in my darkest hour they would rescue me from fear and loneliness. As a child who was already fearfully lonely, I drank them in trusting they would slake my thirst for hope. The classrooms were simple. The teachers were untrained and sometimes unskilled. But the story was enough. It captured my imagination and my faith’s desire. I excelled at knowing The Book. I could quickly manipulate its pages and was taught to use it, accordingly, as my sword. It was a story unlike any other. Its characters were real and I could see them in my mind. I often wondered about their lives outside the written tale captured on the page. Unbound by time, it bid me come and join its narrative. We were warned that some of our own friends would not continue on this journey along with us. And even though we were cautioned that the price for being a child of The Book might cost us everything one day, I don’t think I ever believed it as a child. I went on to study The Book with an aim to make teaching it to others as my vocation. Belief in its pages became more nuanced and intentional. My mind was stretched. Theories and difficulties of historical and textual criticism came and were answered in my mind. Questions about interpretation were satisfied and I moved on. Then I learned the largest threat to this child of The Book would come from a place I never suspected. While the story had continued to compel and speak to me of a new way to love my neighbor as witness to Resurrection Life, for many of my fellow believers it did not. They began to hear voices tell them that this story needed polish in order to be sold, then purchased, by our culture. Soon the story wasn’t to be approached without multi-media support. I was told that children just couldn’t learn it without a video and high-energy game to capture their attention first. Even then, it seemed our culture wanted to hear moral tales that resembled popular psychology more than the story I knew as a child of The Book. I would soon realize that there was no place for a child of The Book, even within the institution that nurtured them. Yes, I had great dexterity at reaching and equipping people of The Book. And, again, yes I had degreed myself to be at the top of my field. But my love for the story wouldn’t be enough to sway the marketers and captain of this new industry. The Book was a product and it was their job to sell it. My way of telling the story and loving people, just wouldn’t produce enough. Time and perspective has allowed me to see that it was not me, in myself, that wasn’t productive enough to serve the institution of The Book. No, it is that the story itself is no longer enough. Like people of The Book throughout time, the institution has been swayed by its surrounding culture. No longer set apart as holy, they bow willingly to the idols of success, wealth, intellect and power. Yet while I can remove myself from this failure, I am still a child of The Book. I feel its rejection keenly. When it is too old to be relevant, so am I. When it no longer sings, neither do I. When the story isn’t enough, I find myself without a home, a stranger lost and alone in a place I pledged to serve yet can no longer have voice. Maybe this is what my teachers meant when they said being a child of The Book could carry a price. It is lonely and isolating. No longer welcomed by the institution of The Book, I am also rejected by those who spurn it as well. I find myself standing alone between the two, wondering why The Book and I aren’t enough. As I grow older, I am still a child of The Book and it is still enough for me. Within its pages I find the only instruction that eases the pain of the world around me. But I have no place to serve The Book, no place to bloom. I sometimes fear the time has passed for me to serve The Book and its people. I am bound by age in an Age that can only esteem the idolatry of its time. These days I often cradle with it open in my hands, letting my eyes roam its pages and feeling them cool beneath my fingertips. Its passages are familiar. They are a balm for this un-healing wound I will carry until these idols fail, or I am called to meet author of The Book. The Revised Standard Version (Oak Harbor, WA: Logos Research Systems, Inc., 1971), Ps 42:4. The Revised Standard Version (Oak Harbor, WA: Logos Research Systems, Inc., 1971), Ps 26:8. The Revised Standard Version (Oak Harbor, WA: Logos Research Systems, Inc., 1971), Ps 27:4. The Revised Standard Version (Oak Harbor, WA: Logos Research Systems, Inc., 1971), Ps 92:12–15. It seems that I have landed myself in a somewhat controversial vocation. Initially, I didn’t dream that special needs advocacy could provoke so many disputes. I had assumed that everyone would be on the “same page.” Silly me. While I knew of (and completely support) a variety of approaches for ministry to children with special needs, I have learned over the past year that many times the waters are murky. Terms like “inclusion” and “self-contained” claim prominence in a debate that I hoped would be about drawing people to Jesus. People who, by the way, desperately need the Story. The Story I am referring to is the old, old story – that overarching story of reconciliation that we call The Bible. People with and those affected by disability need to hear the unmistakable refrain that echoes through all 66 books: God created humanity in his image, loves us, and went to great lengths to redeem us. All of us – even those that the world considers damaged, broken and disposable. Last spring I was given an opportunity to do something I never thought I’d be able to do. I was asked not only to edit materials in such a way as to tell that story to children with special needs, but to help design a VBS format to do it in. Beyond the arguments and disputes of “inclusion” and “self-contained” classrooms, I got to write materials that send the message of the Gospel out for all children. Even those who are very different. Noah was thrilled with my opportunity. When I was in ministry, Vacation Bible School was the bane of his summer. It disturbed his schedule. The decorations disrupted the predictable environment he clung to. Everything from worship to crafts to Bible story was offensive to his delicate nervous system. He even hated the shirts. 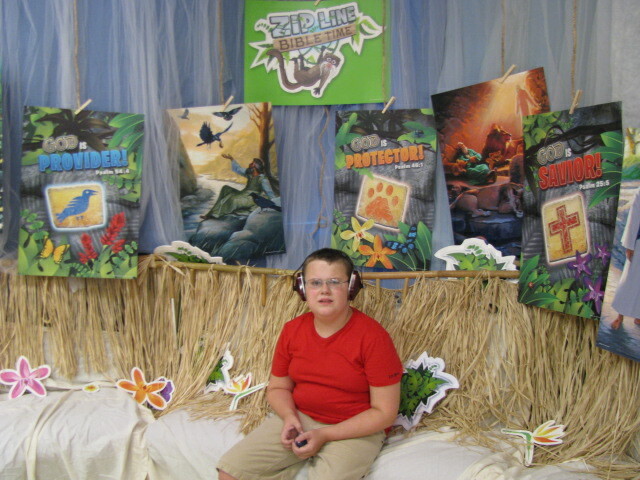 Over the years, my teaching team found countless ways to integrate Noah into VBS. Those efforts were precious to both of us. When he heard I was writing to give suggestions that make it possible for kids like him to have an easier time at VBS he said, “This is great. We can do it Mom, if we just have a little help.” That “little help” is what I have been working on for several months now. As I wrote I found it included modifications to story telling techniques and games, as well as instructions on how to make “members” of the disabled. Offering them places as members in our community, it turns out, has much more to do with making ourselves more open to them than changing them. I will ever be thankful to Standard Publishing for their openness to every suggestion I made. As a matter of fact, in a meeting when we discussed available space for both a special needs amendment and a “regular lesson” the question was asked: What happens if we don’t have space for both? The answer given was: Then the special accommodation BECOMES the lesson for EVERYONE. That, my friends, is inclusion on a level different from any popular dispute about least restrictive environment. It is about membership. On top of the enormous opportunity to write for this project, the team invited Noah and Ito be a partof the video shoot for the VBS video. So, Noah and I, armed with noise reducing headphones and other sensory accommodations trekked to Dayton,Ohio. If you are wondering what Noah thought of this you will be glad to know that he kind of viewed it as a mission trip. He was determined to show people what a “little help” looked like. So learned the VBS songs and performed them on video – with his noise reducing headphones. He took park in lessons and games using those and other accommodations I had written. For a break in the day we visited Safari Sensory Station, a special space I created for sensory breaks and one-on-one teaching at VBS. At lun ch on Day 2 of the shoot we were having lunch in the Green Room (which as Noah pointed out was not “green” at all). He and I has gone through the line ahead of time and were sitting alone at a table enjoying lunch. Soon the other kids and adults filed in and started eating. But then something amazing happened. Why did this happen? Why did 5 kids who had never met Noah just 24 hours before not want him to eat alone? Besides, wasn’t I there? What prompted them to include him in their lunch bunch? How did he become a “member” of a group of strangers? I can tell you how. He had been included, to the best of his capabilities, in worship and lessons and games and crafts. Did he take breaks? Yes. Was he in 100% of every activity? No. But his very presence and participation on some level told these kids that he belonged there. He was a member of them. At the end of our time there I asked Noah how he felt about the project. He said, “It made me feel really special – but not in the bad way.” Apart from feeling different and apart from the group, I think Noah felt honored for those differences. Still a member of the body, but with a very unique gift to offer. You know, special…but not in the bad way. That, my friends, is membership. can your find the special needs kid? Helping make jungle vines on set up day.